Blog Designer Pack Pro is a WordPress blog / news plugin. It is a complete solution for blog or news website. The plugin is very simple to use. Start your blog site or news site with just few clicks!! Here you will find the main features which are included in our Blog Designer Pack Pro Plugin. Load More and Prev - Next Ajax Pagination. Shortcode Generator with Live Preview Panel - No hassles for documentation. Amazing Shortcode Template Functionality - Control your shortcode from one place on various location!! Created with WordPress Template Functionality - Modify plugin design from your theme. Set "Order" and "Orderby" sorting parameters via shortcode. Plugin settings page holds various settings. These are the global plugin settings. Some settings can be overwritten from the post settings. Select your desired post type to enable post type support. You can enter post type name and category name within the shortcode parameter. Note: `post` will be remain enabled by default. Trending post settings holds the trending post related settings. Select your desired custom post type to enable post type support for trending post. You can enter post type name and category name within the shortcode parameter. Note:The post view count will be stored when user visits the post page. Social sharing settings holds the post sharing related settings. Check this box to enable social sharing globally. Choose your desired social sharing service. Note: Social sharing will be displayed in same order in which you save. Enter sharing label which will be display on social sharing icon on single post pages. Choose social sharing icon theme. Select your desired custom post type to enable social sharing support for single post pages. You can simply override plugin css form here. These are the plugin miscellaneous settings. Check the box if your theme or any other plugins uses the font awsome css. Blog Designer Pack plugin will not enqueue it's own CSS for speed concern. Check the box if your theme or any other plugins uses the Owl Carousel css. Blog Designer Pack plugin will not enqueue it's own CSS for speed concern. These are the blog post meta box settings. Control custom link, reset post view count and etc. Check this box to disable social sharing for this particular post. Note: This option will only be display when sharing is enabled from plugin settings. Check this box to mark this post as a featured post. You can display only featured post via plugin shortcode. Enter custom read more link for post. Leave empty for default post permalink. This display the total number of post view count by visitor. You can reset post count by clicking 'Reset Post Count' button beside the post count. 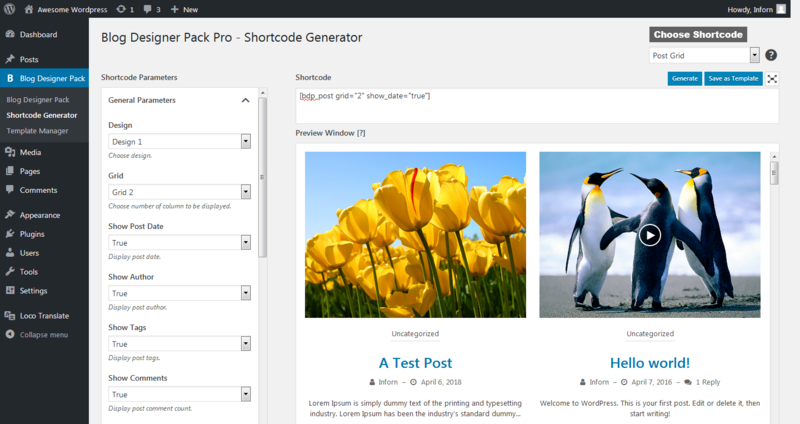 Shortcode generator is a very useful tool to generate plugin shortocde. It allows you to preview plugin shortcode. You can choose your desired shortcode from the dropdown and check various parameters from left panel. With shortcode generator you can refer various shortocde parameter and check it's output with live preview panel. There is no need to refer plugin documentation deeply. You can paste shortcode to below and press Generate button to preview so each and every time you do not have to choose each parameters!!! Shortcode generator is a very handy tool like WordPress Customizer!! Check shortcode generator within plugin menu. Shortcode Template Manager is one of the my favourite functionality within plugin. Shortcode Template Manager is a container of your shortcode. It means it holds your desired shortcode with parameters and control from one place. So it is the central management of a shortcode which reflects the output at every places where you have added template. You can easily enable / disable it. Amazing!!! A most powerful functionality for those who update their site page frequently. A handy and hassles free functionality. Why don't you try shortcode template manager from plugin 'Template Manager' menu. Plugin contains nine types of different shortcodes depending your need. Note: Please enter the shortcode into 'Text' tab of WordPress plugin editor without 'code' HTML tag OR use 'Shortcode Generator' tool within plugin. Here are the plugin shortcodes. Common parameters which works with all shortcode. Enter registered post type name. You can find it on plugin setting page. Note: Be sure you have added valid post type name otherwise no result will be displayed. Enter registered taxonomy name. You can find it on plugin setting page. Note: Be sure you have added valid taxonomy name otherwise no result will be displayed. Enter registered tag taxonomy name. You can find it on plugin setting page. This is just to display post tags. Note: Be sure you have added valid tag taxonomy name otherwise no result will be displayed. Leave it empty for default. Select display type of post. Is it Featured or Trending? Supported values are 'featured' OR 'trending'. Display sticky post. Supported values are 'true' OR 'false'. Display post author. Supported values are 'true' OR 'false'. Display post date. Supported values are 'true' OR 'false'. Display post categories. Supported values are 'true' OR 'false'. Display post tags. Supported values are 'true' OR 'false'. Display post comment count. Supported values are 'true' OR 'false'. Display number of post content words. Display post read more button. Supported values are 'true' OR 'false'. Enter your desired read more button text. Choose post link behaviour to open in a new tab or same tab. Supported values are 'self' OR 'new'. Choose WordPress registered image size. e.g thumbnail (150 X 150), medium (300 X 300), large (1024 X 1024), medium-large (768 X 768), bdpp-medium (640 X 480), full. Note : These are the WordPress registered image size. When you upload the image in WordPress it creates various size of images. You can call them as per your need and speed concern. These sizes may very depending on your theme or any third party plugin with this functionality. Recommended size is 'medium' or 'medium-large'. Set previous button text. You can enter any Text or Html entity. Leave it empty for default. Set next button text. You can enter any Text or Html entity. Leave it empty for default. Enter total number of post to be displayed. Enter -1 to display all. Leave it blank for default. Select sorting order. Supported values are 'DESC' OR 'ASC'. Enter category id to display categories wise. You can pass multiple ids with comma seperated. You can find id at relevant category listing page. Exclude post category. Works only if `Category` field is empty. You can pass multiple ids with comma seperated. You can find id at relevant category listing page. If you are using parent category then whether to display child category post or not. Supported values are 'true' OR 'false'. Enter id of the post which you want to display. You can pass multiple ids with comma seperated. You can find id at relevant post listing page. Enter id of the post which you do not want to display. You can pass multiple ids with comma seperated. You can find id at relevant post listing page. Enter author id to display posts of particular author. You can pass multiple ids with comma seperated. You can find id at users listing page. Enter author id to hide post of particular author. Works only if `Include Author` field is empty. You can pass multiple ids with comma seperated. You can find id at relevant users listing page. Exclude number of posts from starting. e.g if you pass 3 then it will skip first third post. Note: Do not use limit=-1 with this. Enter an extra CSS class for design customization. Note: Extra class added as parent so using extra class you customize your design. We have listed unique parameters for this shortcode. Checkout common parameter which works with all shortcode. Choose your favourite layout. Values are design-1 to design-18. There are total 18 designs for carousel. Display pagination. Supported values are 'true' OR 'false'. Choose pagination type. Supported values are 'numeric' OR 'prev-next', 'load-more' and 'prev-next-ajax'. Choose your favourite layout. Values are design-1 to design-10. There are total 10 designs for slider. Enable slider arrows. Supported values are 'true' OR 'false'. Enable slider pagination dots. Supported values are 'true' OR 'false'. Enable slider autoplay. Supported values are 'true' OR 'false'. Enable slider loop. Run slider contineously in looping. Supported values are 'true' OR 'false'. Autoplay pause on hover. Supported values are 'true' OR 'false'. Slide margin. This is the gap beetween two slides. Enter slider stage padding. A partial slide will be visible at both the end. Enable slider auto height. Supported values are 'true' OR 'false'. Enable url hash listner of slider. Supported values are 'true' OR 'false'. Enable slider lazyload. Slider images will load once the page is loaded. Supported values are 'true' OR 'false'. Enter number of slides to show. Enter number of slides to scroll at a time. Choose your favourite layout. Values are design-1 to design-12. There are total 12 designs for gridbox. Choose height of the post image or gridbox. Choose your favourite layout. Values are design-1 to design-7. There are total 7 designs for gridbox slider. Choose your favourite layout. Values are design-1 to design-7. There are total 7 designs for post list. Choose your favourite layout. Values are design-1 to design-16. There are total 16 designs for post list. Choose masonry loading effect. Values are effect-1 to effect-8. There are total 8 effects. Choose your favourite layout. Values are design-1 to design-10. There are total 10 designs for post list. Enter registered post type name. You can find it on plugin setting page. Note: Be sure you have added valid post type name otherwise no result will be displayed. Enter registered taxonomy name. You can find it on plugin setting page. Note: Be sure you have added valid taxonomy name otherwise no result will be displayed. Choose ticker heading font color. Choose ticker font style. Supported values are 'normal', 'bold', 'italic' and 'bold-italic'. Choose ticker effect. Supported values are 'slide-v', 'slide-h' and 'fade'. Category contains 2 types of different shortcodes depending your need. Here are the category shortcodes. Enter limit to display number of categroies. To display all categories, please pass the limit="-1"
Choose your favourite layout. Values are design-1 to design-5. Enable link for category or not. Choose link behaviour to open in a new tab or same tab. Supported values are 'self' OR 'blank'. Get direct children of this term (only terms whose explicit parent is this value). If 0 is passed, only top-level terms are returned. Default is an empty string. Get all descendents of this term. Default is 0.
count - Based on category post count. name - Based on category title. slug - Based on category slug. Show empty terms or not. Values are 'true' or 'false'. Display category title or not. Values are 'true' or 'false'. Display category count or not. Values are 'true' or 'false'. Display category description or not. Values are 'true' or 'false'.. Enter id of the category which you to display. You can pass multiple ids with comma seperated. Enter id of the category which you do not want to display. You can pass multiple ids with comma seperated. Exclude number of category from starting. e.g if you pass 3 then it will skip first third post. Note: Do not use limit=-1 with this. Choose pagination type. Supported values are 'numeric', 'load-more' and 'prev-next-ajax'. Plugin contains one types of miscellaneous shortcode depending your need. Add break-down point value to make it responsive. The Blog Designer Pack Pro is made with WordPress standard and it is developer friendly. The plugin contains some markup files within the /templates/ directory. design-1.php to design-16.php -- There are total 16 designs within the grid. design-1.php to design-10.php -- There are total 10 designs within the slider. design-1.php to design-18.php -- There are total 18 designs within the carousel. design-1.php to design-12.php -- There are total 12 designs within the gridbox. design-1.php to design-6.php -- There are total 6 designs within the gridbox slider. design-1.php to design-7.php -- There are total 7 designs within the list. design-1.php to design-16.php -- There are total 16 designs within the masonry. design-1.php to design-10.php -- There are total 10 designs within the timeline. design-1.php to design-5.php -- There are total 5 designs within the taxonomy grid. design-1.php to design-5.php -- There are total 5 designs within the taxonomy slider. design-1.php to design-7.php -- There are total 7 designs within the post list widget. design-1.php to design-4.php -- There are total 4 designs within the post slider widget. * New - Added social sharing functionality with shortcodes as well as post single pages. * New - Added 'sticky_posts' shortcode parameter. * New - Added 'Visual Composer' page builder support. * Fix - Admin post meta not showing when post type is enabled only from 'Trending Post'. * Fix - 'Prev - Next' button text not showing in grid box design 1 and design 2.